Our 2017 Beneficiary: Andrew Conforti! The Charles Seller Foundation is more than happy to announce and share our beneficiary for this year! Andrew is a 21-month-old resilient boy who was diagnosed with Langerhan’s Cell Histiocytosis (LCH) just two days following Christmas in 2016. LCH is a rare condition that can strike between the ages of 1-3 and in other cases, older children and adults. The location of LCH appears on the body and the age of its onset determines the stage and diagnosis. Andrew ended up with a swelling under his right eye (on the orbital bone); which was originally diagnosed as allergies. But in a short time, the mass had changed, becoming hard and more prominent. Andrew and his twin brother Matthew had ear infections; which was thought to have caused the change in the swelling of Andrew’s eye. An antibiotic was prescribed to help with the ear infection, but within days, the swelling became worse, spreading from under the eye to the side and top with sudden bruising. The Pediatrician believed it was possibly an infection or a fracture from an undetected fall. Andrew’s family rushed to the local emergency department, where MRI’s and CT Scans were taken to identify the cause of the swelling and bruising. That’s when we were given the devastating news. Andrew had a cancerous mass affecting that area which was overtaking the bone. Andrew was admitted on the spot, 12am Sat. morning, and was scheduled for a biopsy that following Monday to identify the type of Cancer his family was dealing with. Unfortunately, it took a couple of weeks before we received the correct diagnosis because the specialists were away due to the holidays. However, when the first diagnosis came in at the end of December, it was determined to be a cancerous growth called a Giant Cell Tumor. Andrew and his family were called in to see the doctor who performed the biopsy. She scheduled Andrew for an extremely invasive surgery including the removal of the affected bone which would have been replaced with a bone graft from his skull, being that surgical removal is how this form of Cancer is usually treated. The diagnosis of LCH came in from the second opinion the day they were going to register Andrew into the hospital to be prepped for his surgery for the following morning. There are different types of LCH and it is often misdiagnosed due to its rarity and behavior. As you can see, Andrew was misdiagnosed four times before they were able to get him the help he needed. Nonetheless, while there is conflicting information on the subject, Andrew’s LCH is considered malignant and is being fought with Chemotherapy. Depending how well he responds will determine the length and type of treatment he needs. While going through this difficult time, Andrew continues to have a wonderful spirit and playfulness. His ability to still act like a typical toddler has been getting his family through this challenging time. Please help The Charles Seller Foundation support this strong little boy and his amazing family in their goal to see their son, Andrew, continue battling this rare disease as the fighter he is now. Thank you for an amazing year last year We are excited to announce our executive board, beneficiary, production team, show, and audition & show dates for this year! Auditions and Show dates ! Its time to cut loose! The Charles Seller Foundation Talent Time Players are presenting Footloose the Musical for the 2015-2016 summer production! Auditons will be: May 23rd and 24th with call backs May 25th at Christ Episcopal Church 74 Park Ave, Glen Ridge,NJ 07028 6:30 PM. Please prepare 16-32 bars of a modern pop musical song to sing. Also please dress comfortable to dance! The 2015-2016 Executive Board is pleased to announce that Lyle Dungee will be our choreographer for the summer! We are also excited to announce that this summer’s production will be….. FOOTLOOSE! Audition dates: May 23rd, 24th and callbacks 25th 6:30-9:30pm, at Christ Episcopal Church Bloomfield, NJ. We will be posting an audition form to bring to auditions soon on the organizations Facebook page so be on the look out . Show dates: August 4th, 5th, 6th, 11th, 12th, and 13th. The 2015-2016 Executive Board is pleased to announce our director Josh Cohen for our summer musical production. Stay tuned this week for more production team announcements and this year’s show! Auditions will be May 23rd and 24th; callbacks May 25th. The 2015-2016 Executive Board is pleased to announce our producer Abby Miles for our summer musical production. The Charles Seller Foundation is excited to announce their 2016 beneficiary: Jordan Williams ! Jordan is a 7 year old resilient girl who was diagnosed with (Acute Lymphoblastic Leukemia) just three days before her 7th birthday in 2015. As if hearing the word “cancer” wasn’t scary enough, she had to spend her birthday in the hospital, making matters worse. Jordan immediately started chemotherapy but has had minimal side effects and few hospital stays. Jordan is a fighter, does not let the medicines bring her down even when it makes her very tired. She fights and stays strong . One of the things that saddened Jordan was not being able to attend school or see her friends. We are grateful for the help from Goryeb Childrens Hospital in Morristown, NJ who donated a robot that stood in Fair View Elementary School in her place during her absence. Jordan was able to maintain her happiness by logging on from her computer at home to see her teachers and friends. Another difficulty that made Jordan sad was losing her hair. One of the toughest moments for Jordan’s parents was having to reassure her that hair doesn’t define her beauty, and it will grow back in time. When the time came to cut all of Jordan’s hair, she decided to shave her hair and place a cancer ribbon symbol on the back of her head. Jordan loved it and this allowed her to feel like herself again. Jordan is now in her maintenance stage and is also attending school again. Jordan still has to take about 15 chemotherapy medicines weekly, but she doesn’t let that affect her spirit. She loves to play Just Dance 2016, loves makeup, dressing up, singing, coloring, building Legos, her Barbies, and her American Girl Dolls. Jordan is an inspiration to all. As she reaches her 8th birthday, this February 19, she is happy to be here, as cheerful & irrepressible as she always was. Jordan always keeps a smile on her face regardless of what she is physically feeling. As her parents continue to drive Jordan back and forth to the Hospital (45 minutes away) they keep their spirits high, and faith even stronger! Nothing beats keeping their kids happy! Please help the Charles Seller Foundation support this strong little girl and her amazing family in their goal to see their daughter, Jordan, continue battling her cancer as the fighter she is now, and to be able to live a long healthy life, telling her story with the smile on her face! The Charles Seller Foundation would like to thank each and every person who supported in any way over the past three months. 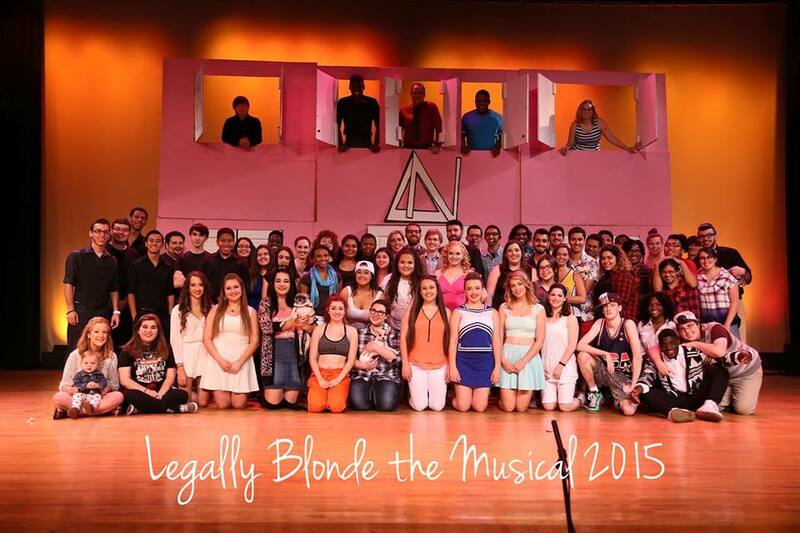 The cast, crew, and production team worked incredibly hard to have as amazing as a production as we did. Countless hours were spent in rehearsals getting ready for performances, but countless hours were also spent at car washes and ad drives doing our best to raise as much money as we possibly could. We would also like to extend a huge thank you to everyone who came out to see our show and support Adriana Torres as well! As our President, Jon Lopiccolo said, we would not be able to produce a full length musical production and support someone in need without you. Our organization has 66 years of history, and we want to see it have another 66 years, and because of you, it is possible. As always, stay tuned in for updates on fundraisers and other ways to support us! 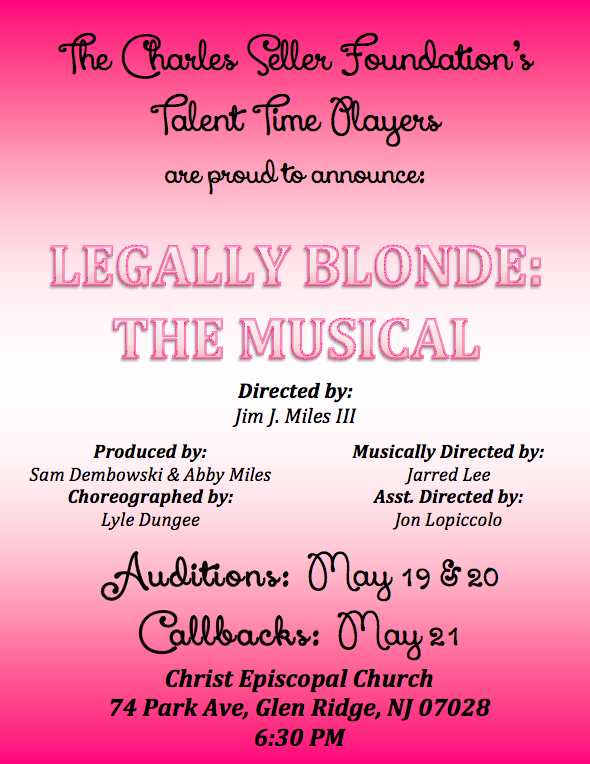 The Charles Seller Foundation’s Talent Time Players presents Legally Blonde: the Musical! 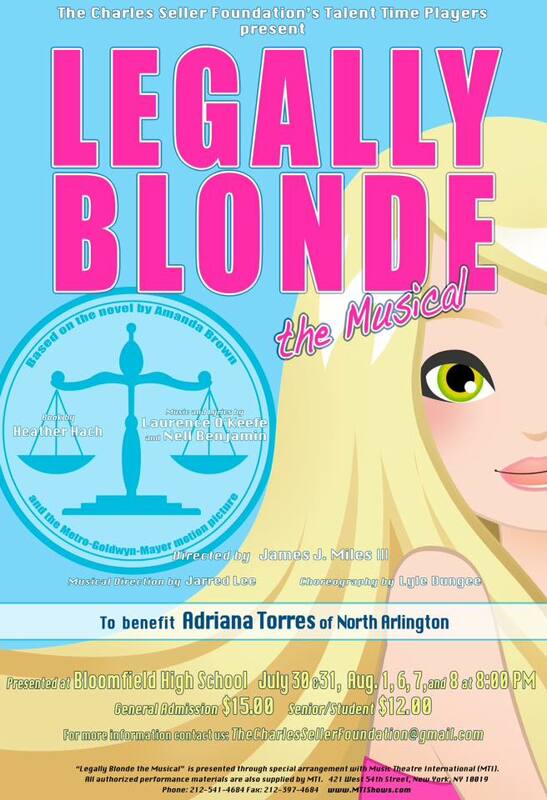 This year’s production will be benefiting 6 year old, Adriana Torres who suffers from cerebral palsy. Performances are at 8:00 PM on July 30, July 31, August 1, August 6, August 7, and August 8 at Bloomfield High School (160 Broad Street, Bloomfield, NJ 07003).